I feel compelled to write about Rob Ford now that he has become part of the America’s public consciousness. After all, his late night appearance on Jimmy Kimmel not only made waves across Toronto media, it also boosted Kimmel’s ratings by 19%. Rob Ford is a bona fide celebrity, whether the people of Toronto want it or not, and it’s important to understand how he created such a loyal following. Most importantly because after the different videos documenting his antics are shown, the inevitable question is, “how is this guy running for re-election?”. U.S Media loves to point out that the “Crack Mayor” has polling numbers that show a surprising level of support, as if it were some sort of punch line about the city as a whole. Because Rob Ford seems crazy, people outside of Toronto can only assume that Torontoians are equally crazy for supporting him. No matter what he does, his approval rating rarely drops below 40%. 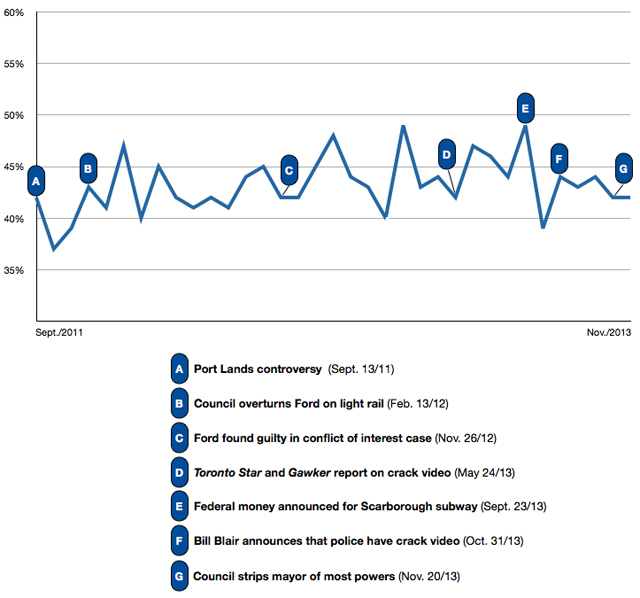 Here is an interesting graph of Mayor Ford’s approval rating during different controversies from 2011 to 2013 I saw in an article on Torontoist two weeks ago. Rob Ford’s strength is that he has made himself out to be an average hard working guy who is accessible to the citizens of Toronto. He is the kind of guy who directly disobeys his communications staff in favour of giving out his personal cell phone number, or coming directly to his constituents’ doorsteps to discuss issues. In an age where political messaging and posturing is so crafted, where images are perfected, Rob Ford stands out for better or worse. Let’s not forget that George W Bush was the presidential candidate that most American’s wanted to have a beer with and he won the election partially based on that. People shouldn’t be voting for their leaders based on how agreeable they would be as a drinking buddy, but we can’t help ourselves. We want leaders, but we also want somebody that we can identify with. We desire somebody better than ourselves to lead us, but not someone explicitly better. Not somebody too good for us. During my daily commute I listen to talk radio. I hardly know what the faces or backgrounds of the host, but I have nevertheless come to feel that I have relationships with the hosts. They speak to a large audience, but radio has some magic that is very individual. I assume that’s it’s partially due to the direct connection between speaker and listener, but also the fact that it is live on-the-air radio. It has an unparalleled degree of verisimilitude because it is so direct. To bring this back to public relations and propaganda: It makes me think about FDR’s famous fire side chats devised by the Office of Public Information that helped him become a President loved by the people. Now, Rob Ford is hardly a Roosevelt, but I feel that he does owe a lot of his support to his use of radio. Way before he was a mayor he had “What’s Eating Rob Ford” a weekly segment on AM640. He also used other talk radio shows to get his message across by calling in. Once he was mayor, he had another other radio show with his brother, “The City with Mayor Rob Ford & Councillor Doug Ford” this time on rival station CFRB. While I did not listen to either of these shows, I can understand how fans of his would really like this type of connection and access. I can also understand the necessity to connect directly to his constituents rather than use traditional media who have been somewhat hostile to him since he was a councillor. For the members of Ford Nation who have been rooting for the Ford family for years, Rob has become a pretty sympathetic character. He is widely disliked and ridiculed by media not only in his own town, but now across the continent. He is also apparently dealing with numerous personal issues: drug addiction, alcohol abuse and weight issues. Although he never seems to play the victim for these specific issues, I still believe his supporters feel sympathetic to him. Not in the late-night talk-show feigned concern, but in a way that is much more personal. For the people that hate Rob Ford all these issues only make him more of a liability for the city and clearly show how unfit he is for office. For his supporters though, there is a real concern that Rob get help with his issues so he can overcome them and get back to being the sort of person that they want to see lead. It’s that personal connection that his supporters feel for him. I believe to them he is more than just a politician they want to vote for, he is somebody they feel they know and care for. They are sympathetic to his problems and are becoming increasingly defensive when he is brought out only to be humiliated. When Jimmy Kimmel showed images of Los Angeles mayor Eric Garcetti with images of Rob Ford it was a study in contrasts. Sure, Mayor Garcetti looks great in his photo opportunities, but the contrast really brings back what made Rob Ford so popular with his constituents in the first place. He isn’t the slick politician, he isn’t good at photo ops, he isn’t postured by a team of experts. He is who he is, unapologetically. Rob ford has harnessed this sort of populist ethos very well. Whether genuine or not, he created an image that felt authentic, a sort of what-you-see-is-what-you-get mentality for voters. This has also been his tragic flaw in the past year, as he has been unable to help himself. The same qualities that brought him close to voters and made him stand out from the pack, and the very same qualities that are now playing a large part in his inability to rehabilitate his image. I do not live in Toronto so I cannot vote in the mayoral election. However, I fear that this election will become so focused on an “anybody but Ford” race, which may not be in the city’s best interest. It would be nice to have a candidate that took Rob Ford’s politics, ethos and dedication to the tax-payer without any sort of crazy personal or legal issues. Rob Ford has really fallen from grace, and likely will neither be able to re-build his image to gain any new supporters, nor should he. It would be best for Toronto if he just moved on, but don’t let the exuberance of watching him self-destruct get in the way of the lessons he taught us. If you can do all the crazy things that Rob Ford has done in the past 8 months, and still have a large base of support that isn’t based in a specifically political ideology, surely you’ve done something right. This entry was posted in Canada, media, Politics and tagged FDR, Jimmy Kimmel, Loyalty, Radio, rob ford, TOpoli on March 5, 2014 by The Benign Propagandist.